Visitez l'un des parcs les plus populaires d'Afrique lors de cette excursion d'une journée à Chobe au départ de Victoria Falls. Parcourez les paysages accidentés de la campagne africaine en gardant les yeux rivés sur Big Five. Chobe est connue pour sa forte concentration d'éléphants. Vous êtes donc presque assuré de voir ces mammifères géants errer dans le parc. Vous voyagerez par voie fluviale et terrestre, en vous assurant les meilleures chances d'observer la faune africaine. We loved the boat and game drive. 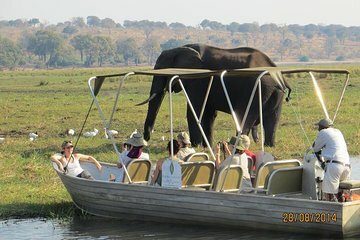 We were on the smaller boat and it was great because we could get closer to shore and get a closer look at the animals. Our guides were great and stopping for us and giving us enough time to take pictures. The lunch was delicious too, good veggie options. The morning river cruise was fantastic. We saw elephants cross the river. Baby elephants used their trunks as snorkels!What we missed was a look at the hippos. There were lots of them around but after we spent too much time with the elephants, we had no time for the hippos.The afternoon game drive was a disaster. The Toyota pickups used were not up to the job. We floundered around in deep sand and finally both trucks became hopelessly stuck.Another tour with a Toyota Land Cruiser came along and pulled us out.By then we were late and the border was about to close. No time for a bathroom break and we made a wild dash for the border. We got there five minutes before the border closed and we would have been stuck for the night.It certainly was an adventure but not quite what we had in mind. One of the best Safari experience--the land of the giants. Very well organized. We were not sure about booking this tour while spending 3 days at Victoria Falls. This tour ended up being one of the highlights of our 3 weeks vacation in South Africa and Zimbabwe. If you have a few days in Victoria Falls, do not miss this tour. If you are in the planning stages of your trip, include an extra day in Victoria Falls so that you can do this tour. You won't regret it. Wildlife viewing here is fantastic. The tour is extremely well organized, and it is the perfect length. fantabulous experience, very friendly and professional guides, super nice lunch buffet big spread with exotic cuisines like crocodile curry. For one day you couldn't ask for more. We got close up and personal with elephants, hypos, and many more animals. The ability to do both water and land tour was nice variety. While on the water we got to see so many types of birds. If you have an available day in Vic Falls I highly recommend this one day safari.